Paragon 76: Great children's vintage intarsia or picture knitting pattern. Koala pattern is available on its own. to fit 24" chest. (3-5 years old) Worked in vintage 4ply, so work a tension square to see if you need to change needles or work in double knitting. Patons 122: Great vintage little girl's fair isle jumper knitting pattern form 1940s. This one is to fit 24 chest or 3-4 years old. Easy design worked in natural base, red, green, blue and tan as contrasts. Three small buttons for back. Knitted in vintage 3ply so try modern 4ply in a tension square with smaller size needles. No chart. Patons 116FC: Great vintage girl's fair isle cardigan knitting pattern 1940s. How cute is she? This lovely fair isle design is in vintage 3ply, so try modern 4ply in a tension square and change needles if needed. To fit 5-6 years (26 inch chest). Colour suggested for authentic look were natural ground with green, red and blue. It was a pattern like this that my mother had that made me want to collect patterns in 1960. I had been knitting since I was 4, in 1960 I was 11 years old and had just finished a fair isle sleeveless jumper for my mother! My first lesson in fair isle. She gave me a whole collection of fair isle patterns she had used during the war and when my brothers and sisters and I were small. (There were 7 of us!) So my collection began! Patons 187: Great vintage knitting pattern for boy's fair isle jumper from 1940s. Lovely design for jumper to fit 10-12 years to fit 30 inch chest, knitted in vintage 3ply, so try modern 4ply in tension square. V neck and classic design in natural base, rust, brown and emerald as contrasts. Always work a tension square. Patons 211: Great vintage child's fair isle jumper knitting pattern 1940s. This is very pretty little jumper to fit 4-6 and 6-8 years or 22 and 24 inch chest. Change of size is by using larger needles. Vintage 3ply so try modern 4ply in a tension square. Colours suggested are light grey ground, then larkspur (probably a light blue), scarlet, emerald, and yellow. Pattern in super condition. Patons 220FC: Great vintage girl's fair isle jumper knitting pattern 1940s. This little jumper is knitted in vintage 3ply, so try modern 4ply in a tension square and change needles if needed. To fit 6-8 years (26 inch chest). Colours suggested in the 1940s were white ground, with Royal blue, larkspur blue, and scarlet. Patons C-259CF: Great vintage knitting pattern childs fair isle cardigan 1950s. This is so pretty and so easy to do, chart is included in the pattern. With sharp white borders and fair isle design, this bright little cardigan would suit any little girl and make a lovey gift. Worked in vintage 4ply, so try a tension square and see if you need to change needles or if a ply change might work better and try modern double knitting, to fit 20-24 inch chest in 3 sizes. 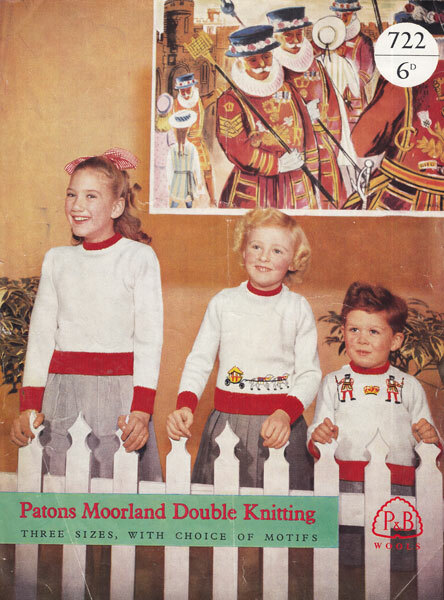 Patons 261FC: Great vintage child's fair isle jumper knitting pattern 1940s. This is a super pattern for boys or girls. Instructions to fit 13-15 years 32 inch chest/bust. With polo neck or can be made easily into round neck. Suggested colours grey ground with brown and emerald, to use authentic colours. Worked in vintage 3ply, so try modern 4ply in a tension square. Patons 270: Great vintage knitting pattern for girl's fair isle cardigan from 1940s. This design is great for the beginner in fair isle as the bands are simple. Lovely fit with set in sleeves and high V neck nipped in waist. To fit 10-12 years old or 30 inch bust. Knitted in vintage 3ply, use smaller needles and modern 4ply for a good fit or for a larger size use size larger needles. Always work a tension square. No chart. Natural, red and green suggested. Patons 286FC: Great vintage knitting pattern for girl's fair isle cardigan 1940s. This little cardi is knitted in vintage 3ply, so try modern 4ply in a tension square. To fit 6-8 years (26 inch chest). Colours suggested in the 1940s were natural ground with green, lime gold, and yellow. Nice deep welt with little pocket and a V neck, set in sleeves very retro. Patons 319FC: Great vintage childs fair isle jumper knitting pattern 1940s. This lovely pattern has instructions for a stunning jumper and a smart cardigan to compliment. To fit 6-8 years (26 inch chest) Colours suggested larkspur blue,emerald green, scarlet, Royal blue on a white ground, but you can use any colours. Nice and easy written instructions. 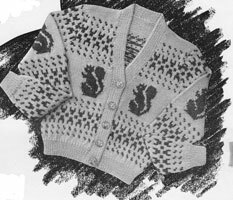 Patons 319FC: Great vintage childs fair isle jumper cardigan knitting pattern 1940s. This lovely pattern has instructions for a stunning jumper and a smart cardigan to compliment. To fit 6-8 years (26 inch chest) Colours suggested larkspur blue,emerald green, scarlet, Royal blue on a white ground, but you can use any colours. Nice and easy written instructions. This is the cardigan from the above pattern, colour suggested Royal blue, mesurements 27 inch chest. Patons 352FC: Great vintage sleeveless pullover tank top style jumper for boy 1940s. This pattern is so retro! Look at the lad! The sleeveless jumper now called a tank top is knitted in vintage 3ply so try modern 4ply in a tension square. To fit 32 inch chest, boys 12-14 years. Colours suggested in the 1940s were natural ground, with brown and green, and small amount of yellow. Patons 370FC: Great vintage girl's fair isle short sleeved jumper knitting patten 1940s. This sweet little jumper would suit boy or a girl between 5-6 years chest 24 inches. It is knitted in vintage 3ply, so try modern 4ply in a tension square and change needles if needed. 1940s colours suggested are blue and white - very striking, as would red and white or green and white. Patons 389: Great vintage girl's twinset knitting pattern with fair isle bordered jumper 1940s. This pattern is to fit 7-8 years or 28 inch chest. The cardigan is plain with set in sleeves and high V neck and the jumper as shown has fair isle yoke, with set in short sleeves. Worked in vintage 3ply, so try modern 4ply in a tension square. Patons 687: Great vintage knitting pattern for a nautical jumper and beret for girl, 1950s. This lovely bright design is to fit 8-10 year old (28 inch chest) in vintage 3ply, so try modern 4ply in a tension square and change needles if needed. Small chart for sail boat. 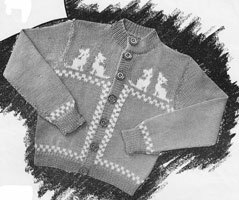 Patons 695: Great little jacket and jumper knitting pattern with fair isle 1950s. There are instructions for the sweet little tyrolean jacket with embroidered flowers and the jumper with cars at the yoke and rib. Jacket and jumper to fit 22 inch chest. Patons 784: Another great vintage pattern from this stable with another christmassy jacket for a young lad, 4-7 years this time, chest measurements 24" for the reindeer and christmas trees jacket and 24" and 25" for the jackets with a collar, knitted in double knitting. Patons 824: Great vintage boy's v neck fair isle jumper knitting pattern from 1940s. This super design is classic with fitted sleeves and neat V neck. To fit 24 inch chest or 4-5 years and is knitted in vintage 3ply so try modern 4ply in a tension square. They suggest a ground shade plus royal blue, corn yellow, crimson, yellow and country brown. Small chart. 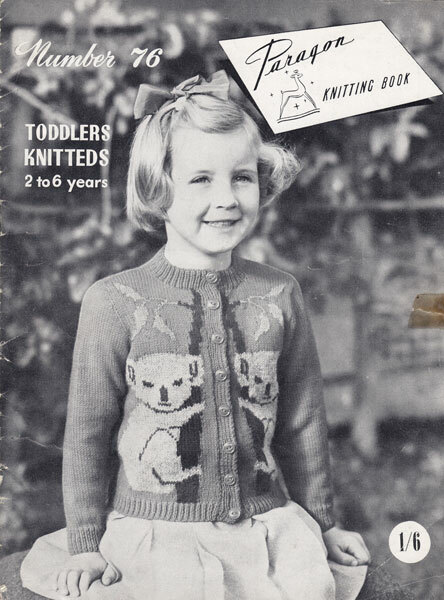 Patons 932FC: Great vintage knitting pattern for little girls jumper with ducks and rabbits 1940. This little pattern has two designs, both knitted in vintage 3ply, so try modern 4ply in a tension square. This one is the one with rabbits and is to fit 2-3 years (22 inch chest) and 4-5 (24 inch chest) there is a chart for this one. Pattern in good condition. Patons 9006: Lovely 1950s pattern for chunky knit cardigan with poodle motif on sides and back, see below, It is worked in chunky yarn and has zip fastener to fit chest size 26 inches to 30 inches (6-11 years). It takes a 14 inch zip at the front and is knitted on large needles old 7 and 3s (4.5mm and 6.5mm) so is quick to make and very special. Always work a tension square with the yarn that you choose and change neeldes if needed.